But let’s be optimistic and assume other jobs do appear for many displaced workers. The situation still won’t be ideal for either them or the economy at large, because they will likely make less money and have less spending power. Karen’s report points out that wages will face downward pressure long before workers get replaced by machines. The mere existence of the new technologies will cap wages as the price of automating vs. employing humans falls. REAL interest rates in the developed world have been low ever since the financial crisis of 2008-09 (see chart). The global economy might have struggled to recover had that not been the case; higher rates would have caused many more companies and homeowners to default. Central banks are now starting to push rates slightly higher. 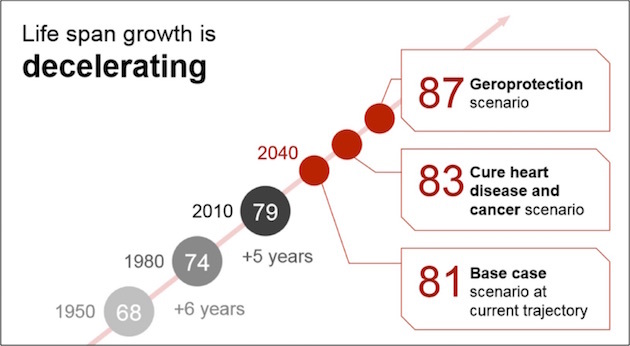 And according to a new paper* from Bain, a management consultancy, the trend towards robotics will push them higher still—at least for a decade. That could be a shock for the financial markets. Bain estimates that by 2030 American companies will have invested as much as $8trn in automation. As companies scramble to borrow money in order to buy machinery and robots, the resulting investment boom will drive up rates. 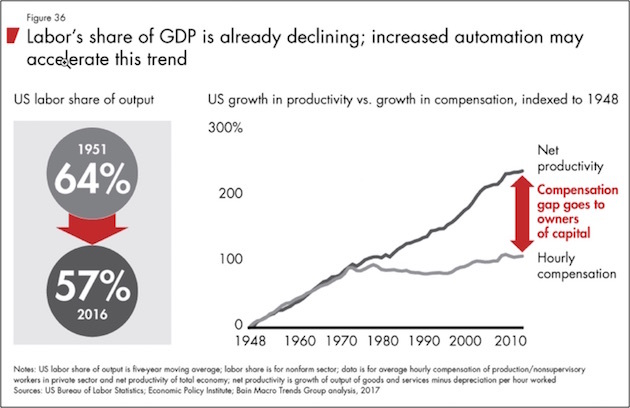 Automation will boost productivity, which has grown sluggishly in recent years. This slowdown may have been caused by the shift from manufacturing to services, where productivity gains are harder to achieve. Between 1993 and 2014, the American car industry more than doubled its productivity, but lost 28% of its workforce. By contrast, over the same period hospitals added 28% more jobs and increased productivity by just 16%. But automation is about to come to a wide range of service industries. 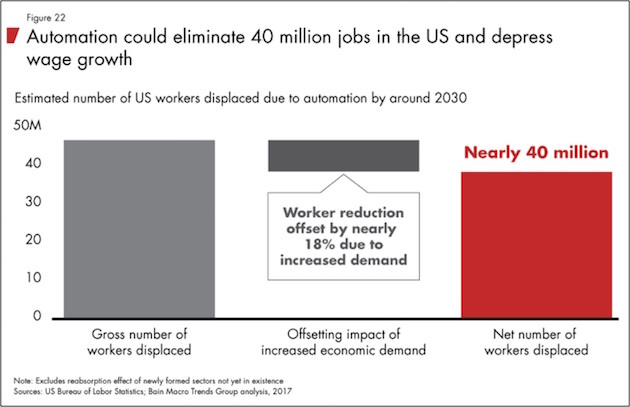 Though that will be a boon for productivity, Bain estimates that 20-25% of current jobs could be eliminated by 2030. 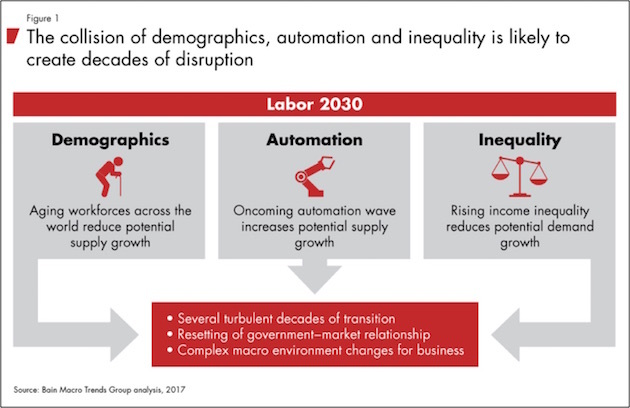 This shift will be much faster than previous labour-market transformations, such as that from agriculture to industry at the start of the 20th century. Lower-skilled workers, such as waiters, will take the biggest hit. The result would be an even more unequal economy, because a greater share of income would go to highly paid workers. They are more likely to save and invest than lower-paid workers, who spend virtually all their income. So after the initial interest-rate surge, the increase in saving and the hit to demand could cause interest rates to plunge again, falling back to zero in real terms. In a paper** written last year for the Bank for International Settlements, a central-bankers’ club, Charles Goodhart and Manoj Pradhan came up with similar predictions for interest rates using a different chain of reasoning. They thought demography would be the main reason interest rates would rise. Real rates adjust to balance the desired levels of savings and investment. The current low level of real rates indicates that the former has exceeded the latter as the baby boomers have made provision for their old age. But global population growth is slowing and the size of working-age cohorts in the advanced economies and China will decline. As workers retire, they will run down their savings pots. Companies will substitute capital for labour as the workforce shrinks. A smaller pool of workers will earn higher wages, pushing up the labour share of GDP and (in a divergence from the Bain line of reasoning) thereby reducing inequality, but also driving up inflation. Keeping it under control will require higher nominal interest rates. Furthermore, desired savings will fall faster than desired investment, and real rates will rise. What about the argument that “secular stagnation” will keep interest rates low? Andrew Smithers, an independent economist based in London, says that because there is no reason to expect world growth to be slower than average over the next decade, global interest rates could well rise to more normal levels. However, he adds, growth may be less important for rates than is the balance between fiscal and monetary policy. With fiscal policy easing in both America and Europe, monetary policy will need to be tightened, he reckons. That would make the road to higher rates a bumpy one. The piles of debt accumulated before the financial crisis have been redistributed rather than eliminated. A sudden rise in rates might hurt economic activity, and thus be self-limiting, if central banks have to reverse policy. Financial markets have translated low rates into high valuations. Equities are priced as the discounted value of future profits; the lower the discount rate, the higher the price. But in the Goodhart/Pradhan scenario, shares might face a double whammy. As employers compete for scarce workers, the discount rate would rise and profits would be squeezed. Homeowners, and companies with lots of debt on their balance-sheets, would get a nasty shock. As rates rise, stress levels will, too. On the heels of historic 2017 complacency in broad equity averages, U.S. financial markets were jolted in the first week of February. The S&P 500 Index1 ended its record-setting streak of 404 trading days unblemished by a 5% correction with a startling two-week pullback measuring 10.16%. Like a Rorschach Inkblot, market observers have branded February’s dislocation to fit their fancy. The bullish précis suggests the short gamma of a tiny group of inverse-VIX ETFs mauled equity markets with bursts of compulsory selling, but these funds’ quick demise has freed equity averages to resume their upward slopes. Echoes of Chairman Bernanke’s March 2007 proclamation that subprime “seems contained” reverberate through recent FOMC characterizations of short-VIX equity declines as “small potatoes” with “virtually no consequence” (William C. Dudley, February 8, 2018), “the most predicted selloff of all times” (James Bullard, February 6, 2018), and ominously, “more volatility in markets can be a healthy thing” (Robert Kaplan, February 7, 2018). On February 18 2018, the Mortgage Bankers Association raised eyebrows with the news that Q4 mortgage delinquencies soared to 5.17% (from 4.24% in Q2). During the past 30 years, the MBA delinquency rate has risen above the critical 5% threshold on only three occasions: March 1991, June 2001 and June 2007, three especially perilous junctures for financial assets. Our anecdotal observation has been that very few investors equate Fed tightening with rising consumer stress. A degree of comfort certainly accrues from the Fed’s household debt-service ratio, which still registers a historically benign 10.29% of disposable income (Q3 2017). Prevailing logic asserts that while debt levels are high, rates are still low, so the debt-service burden remains manageable. We would caution against this conclusion because we believe debt-service ratios have become an ineffective barometer of the consumer stress they were designed to capture. Debt-service ratios measure U.S. aggregate debt obligations versus aggregate disposable income. Unfortunately, the intersection of these two series no longer speaks to actual people. The reality is that most debt obligations are carried by one subset of Americans while the lion’s share of disposable income is enjoyed by a largely different subset. To us, a far more telling measure of the impact on consumer comfort of recent Fed hikes has been the coincident collapse in the personal savings rate. As shown in Figure 2, the personal savings rate stood at 5.8% of disposable income when the Fed first hiked in December 2015 (red arrow). By December 2017, the savings rate had crashed to 2.4%. To demonstrate just how quickly Fed rate hikes can impact monthly cash flows of American consumers, we plot in Figure 3, the monthly ratio of personal interest payments (excluding rent) to personal savings. The current Fed tightening cycle has already led to considerable cash flow stress for many consumers. Indeed, for just the fourth time in history, monthly interest payments are set to exceed monthly savings. With all due respect to the Fed’s dot plot, we find it highly unlikely the FOMC will enact three or four rate hikes this year unless there is significant improvement in the variables displayed in Figure 3. We suspect FOMC participants are profoundly rooting that Trump tax cuts will deliver their advertised boost to take home pay (wages, hours worked) so consumers can ease their reliance on credit cards to fill monthly budget gaps. On the long end of the spectrum, the collateral damage of rising interest rates materialized in far more spectacular fashion than from the Fed’s first rate hikes. The mid-January breakout of 10-year Treasury yields from their 36-year downtrend (around 2.6%), quickly validated by strengthening wage data in the 2/2/18 employment report, promptly kneecapped the S&P 500 by 10.16% (1/26/18-2/8/18), while erasing $5.2 trillion from global equity market capitalization (S&P BMI Index1). Sprott clients should not have been surprised. We have often referenced the MacroMavens portrayal of 10-year Treasury yields reproduced in Figure 4, below. In every instance since 1982 in which yields have backed up significantly, a financial crisis has quickly ensued. In a bit of contemporary structural debt irony, financial stress now inherent in bond market sell-offs tends to make their duration increasingly short-lived. We would agree that circumstances in 2018 are indeed different from those in 2008, insofar as most relevant measures of domestic and global debt are significantly worse today than at their financial crisis peaks. Contrary to popular perceptions of U.S. deleveraging, the Fed’s Q3 2017 Z.1 Report discloses that every category of domestic non-financial credit (other than mortgages) has soared since Q1 2009.
Business debt has grown 26% (from $11.2 trillion to $14.1 trillion); state & local obligations have surged 35% (from $2.3 trillion to $3.0 trillion); consumer credit has ballooned 47% (from $2.6 trillion to $3.8 trillion); and federal debt has skyrocketed 145% (from $6.7 trillion to $16.5 trillion); all contributing to a 43% explosion in total U.S. non-financial credit (from $33.9 trillion to $48.6 trillion). On January 4, 2018, the Institute of International Finance reported that total global debt had increased 56.4% during the past decade (from $149 trillion at year-end 2007 to $233 trillion at Q3 2017), reaching 318% of global GDP. For reference, at 318% of GDP, every 25 basis-point rise in prevailing interest rates costs the world economy 0.8% of global GDP. Because debt levels were identified as a direct cause of the Great Financial Crisis, we recall in the early recovery years a sober and shared resolve to guard against repeating the mistakes of untethered credit creation. What happened to that resolve? To any forensic accountant charged with analyzing the economic solvency of the United States, unprecedented (senior) debt obligations throughout the U.S. financial system would imply that ever-inflating (junior) equity claims rest on exceedingly tenuous grounds. As every traditional methodology for equity valuation has flirted with all-time highs in recent years, the near unanimous justification cited by equity market participants has been that equity valuations are a rational manifestation of persistently low interest rates. Given the famously selective reasoning of equity bulls, we suspect few are willing to concede that rising rates will inflict reciprocal damage on lofty valuations. It always seems to work this way. To us, the greatest yardstick of asset price inflation fostered by eight years of QE and ZIRP has been the Fed’s proprietary calculation of U.S. household net worth (HHNW). We find this measure useful in quantifying potential impact to financial asset prices from reversal of QE stimulus. In Q1 2009, with U.S. GDP measuring $14.1 trillion, household net worth stood at $54.8 trillion. At Q3 2017, with GDP measuring $19.5 trillion, household net worth had exploded to $96.9 trillion. Incredibly, these statistics imply that a $5.4 trillion increase in U.S. economic output somehow powered a $42.1 trillion increase in U.S. household net worth. Narrowing in on the past twelve months, we believe the widening disconnect between output growth and financial asset prices became an important factor in the FOMC’s decision to pick up the pace of rate hikes. The Fed’s Q3 2017 Z.1 suggests year-over-year growth in U.S. household net worth registered a mind numbing $7.2 trillion, during a year in which nominal GDP averaged $19.2 trillion. This means that U.S. household net worth (HHNW) appreciated in twelve months by an amount equal to 38% of total U.S. nominal output, all during a year in which GDP itself averaged only 2.3% growth, and net national savings expanded by roughly 2%. Not since Jesus with the loaves and fishes has asset inflation been so spectacular. Now that the levitating powers of QE and ZIRP are finally being dismantled, it is logical to assume that the ratio of HHNW-to-GDP (currently 496%) will begin to settle back towards its historic 350% average prior to the Greenspan-Bernanke-Yellen era of Fed stewardship. Assuming stable GDP, this implies contraction in the aggregate value of U.S. household holdings of stocks, bonds and real estate on the order of $25 trillion to $30 trillion. To us, the only mystery is which asset class will bear the greatest readjustment burden. Given market projections for three or four FOMC rate hikes during 2018, combined with the current 2.17% premium of 10-year Treasury yields to German bund yields, the U.S. dollar should logically be strengthening. Instead, after declining 9.87% in 2017, the DXY Index1 is off to a shaky start in 2018, declining an additional 3.28% through February 16, 2018. It is now becoming clear that while 2017 equity markets were celebrating Trumponomics and tax cuts, currency markets were already fretting over implicit deterioration in the U.S. fiscal position. In recent weeks, as investors have contemplated the $1.5 trillion “cost” of Trump tax cuts, together with the surprising $300 billion spending hike approved by the Republican congressional majority (all against the backdrop of a suspended debt ceiling through March 2019), legitimate concern has emerged over Treasury funding requirements. The Office of Management and Budget (OMB) now estimates Treasury borrowing needs will almost double from $519 billion in fiscal 2017 to $955 billion in fiscal 2018, and then average $1.1 trillion in each of the next five years. Measured as 5.5% of GDP, Treasury borrowing in fiscal 2019 will exceed any year since 1945. While we have learned nothing is impossible, it seems a stretch that 2018 will witness three or four FOMC rate hikes, $450 billion worth of slated Fed balance sheet reductions and $1 trillion-worth of fresh Treasury issuance, all in the same year. Something has to give. The greatest upshot from the short-VIX market disturbance of early February has been recognition that eight years of QE and ZIRP have mispriced risk throughout the U.S. financial system. As avid students of market events, our heads now spin with technical distinctions between risk, volatility, VAR, and more Greek nomenclature than we can comfortably process. No matter how you slice it, interest rate suppression has introduced a degree of unknowable risk to every asset class. Any investor who claims to understand how eight years of “unconventional measures” will unwind is kidding themselves. Global central banks purchased roughly $2.0 trillion of assets during 2017, and are currently scheduled to purchase only $500 billion in 2018. Factoring in $450 billion worth of quantitative tightening by the Fed, this means that global central bank liquidity provision will shrink by $2 trillion in a single year. We believe the comparatively modest first steps of tightening undertaken to date by the Fed and ECB (reduction in monthly QE) are already constricting global money supply growth viewed by central bankers as essential to stability of elevated debt levels. By way of example, the Fed reports that U.S. January M2 money supply grew only 4.2% (y/y), the slowest since December 2010, and down from 12 and 24-month averages of 5.4% and 6.2% respectively. Even more recently, 10- and 26-week annualized M2 growth had stalled to 1.83% and 3.53% respectively. For perspective, the Fed’s current quarterly QT schedule equates to an annualized hit to total M2 money supply of 1.73% in Q1, 2.60% in Q2, 3.5% in Q3 and 4.3% in Q4. Given recent trends, the Fed’s current QT schedule would flip U.S. M2 growth into outright contraction during 2018. We just don’t think the Fed will let this happen. By all accounts, new Fed Chairman Jerome Powell is an experienced and capable monetary steward. Given the Fed’s somewhat bruised credibility in recent years, coupled with the market tradition of testing the resolve of incoming Fed Chairs, we expect Chairman Powell to stick to telegraphed Fed policy as long as possible. On the other hand, it is difficult to ignore developing parallels to the early tenure of Chairman Greenspan. Mr. Greenspan received Senate confirmation as Fed Chairman on August 11, 1987. Some two weeks into his tenure on August 25, 1987, the S&P 500 Index touched a year-to-date gain of 39.5%. Strength in U.S. equity averages had been all the more impressive because it had occurred into headwinds of rising 10-year Treasury yields, which by September 2 1987, had posted a year-to-date surge of 28%. During Chairman Greenspan’s first month on the job, in what financial media branded “a tough stance on inflation,” the FOMC hiked fed funds by 25 basis points on two consecutive days (September 3 and September 4, 1987) to 7.25%, and then on September 6, 1987, hiked the discount rate by 50 basis points to 6.0%. The discount rate hike was the first in three years, and the fed fund hikes brought the total for the unfolding cycle to 137 basis points. By all accounts, the new Fed Chairman had effectively demonstrated his mettle. The Fed was on the case and, of course, the rest is history. While we hope the remainder of Mr. Powell’s first few months as chairman proves less stressful than the Dow’s 1,175-point swoon on his first day on the job, it is amazing how sometimes history repeats itself. - The 10-year Treasury has soared from the 2.25% range to nearly 2.90% in the past months. - Rises in rates are usually correlated with declines in bond prices; in the case of High-Yield bonds, the relationship is less certain. - High-yields bonds have held up well with the recent rise in rates and increased market volatility. - Investment grade bonds and treasuries have not fared so well. - This idea was discussed in more depth with members of my private investing community, High Yield Bond Investor. Everyone knows that when interest rates rise, bonds go down in value, right? Many investors believe the same correlation applies equally to high yield bonds (so-called "junk bonds"), and warnings about this asset class are common. This article from CNBC describes how short interest in high yield ETFs have reached the highest level ever recorded, as "An environment of rising bond yields overall has dented the sector's popularity, and investors have been running for the doors." 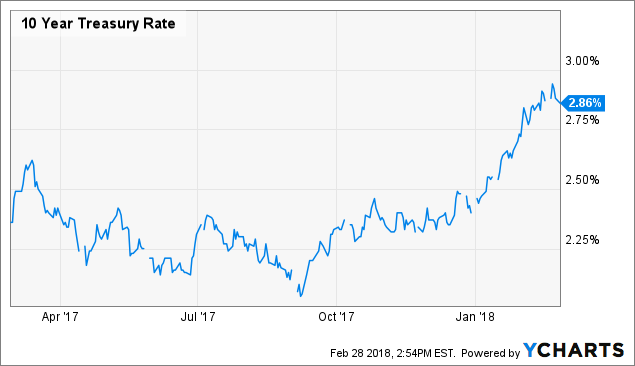 After all, the 10-year Treasury and other interest rates have risen in recent weeks, so surely this means doom, and continues to mean a downturn is ahead for high yield. The chart below shows the rise in the 10-year Treasury from 2.25% range in October to 2.86%, a 60 b.p. rise, a sharp move up, mostly since the start of 2018. So how have high-yield bonds performed during this storm of rising rates since the beginning of the year? The Bank of America Merrill Lynch US High Yield Total Return Index, the best gauge of the high-yield market in my view (as a total return index, it incorporates interest earnings), shows a decline of only about a quarter of one percent. It is safe to call this "flat" performance. Not much of a move for high yield in the face of a 27% rise in the 10-year treasury rate. The real move down in bonds occurred in so-called Investment Grade bonds and Treasuries. 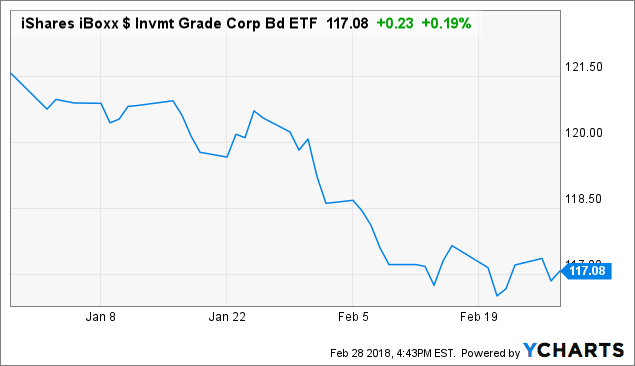 The investment grade ETF, LQD, is shown below. These bonds are down 3.6% on a total return basis, a sharp move down for an asset class that only yields 3.7% - so a year's worth of income decline in only 2 months. 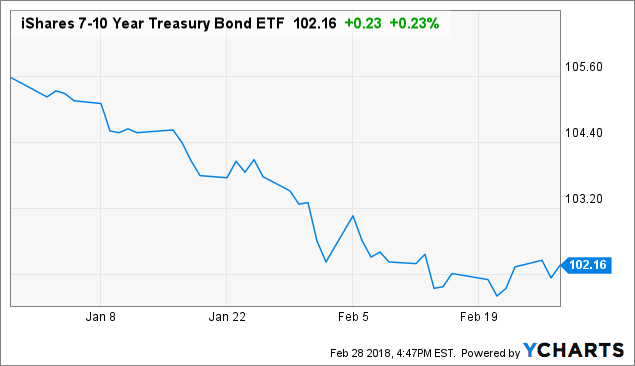 The 7-10 year Treasury bond ETF, IEF, has not fared much better, down 3.3% year to date, a decline of nearly 15 months of income in just two months. Why the sharp divergence in performance between high yield and investment grade categories? Because high yield is a credit risk sensitive asset class while investment grade and treasuries are interest rate risk sensitive. The same dynamics that lead to higher interest rates, such as a robust economy and inflationary pressure, are beneficial to credit risk and boost the performance of high-yield bonds. On the other hand, investment grade bonds already carry low credit risk, so they are priced according to prevailing market interest rates and are therefore far more sensitive to changes in rates. The chart below shows further evidence. On the left are the 12-month periods when the 10-year rate rose by 1% or more (0.98% in the Sep 16-Dec 16 period). As can be seen, Senior Loans, which are typically floating rate, and high-yield bonds performed just fine in these scenarios, while investment grade bonds always fell. High-yield bonds typically react negatively in the short run to rising rates, like they did in the first two months of 2018, but stabilize and recover after that, usually quickly. My expectation for high-yield bonds for the remainder of 2018, barring any major stock market dip, is that once the 10-year treasury settles into a range, which it may have already at 2.8%-3.0%, bond prices will remain steady and interest earnings will kick in and generate 5%-7% returns for high yield for the remainder of 2018. Fed fund increases are already well known and may likely be incorporated into today's 10-year Treasury rate. High-yield bonds will decline if the stock market corrects (again) or worse, as high-yield bonds are considered "risk" assets that typically fall when the stock market falls - but by far less (high-yield bonds are about 33%-40% less risky than stocks) with a far quicker recovery (as was the case in early-2000s and 2008 crashes). The idea of shorting high yield, which I hear about from time to time, makes no sense to me. Just to break-even with a high-yield short, bond prices have to decline by about 6%, as the short seller has to cover the interest earned by the bonds. Factor in shorting costs, and the break-even "decline rate" is probably at least 7%-8%. If an investor wants to short an asset class due to expectations of rising rates, shorting long-dated Treasuries or investment grade bonds makes far more sense. If an investor wants to short an asset class due to expectations of market tops or economic fears (or other shocks), shorting stocks makes far more sense - they will drop far more than high-yield bonds. The U.S. housing market is still showing strength, well into the economic recovery that began in 2009. While single-family housing starts, which totaled an annualized 877,000 in January, are less than half the 1.8 million recorded in early 2006, before the financial crash and recession, there is ample reason to believe that starts, sales, and prices will continue to escalate. Recent housing demand has been boosted by a host of factors, including an increase in millennial home buyers, steady job growth, and relatively low interest rates. There are some reasons for concern, notably affordability in certain markets as demand outstrips supply and the cost of mortgages if interest rates rise. 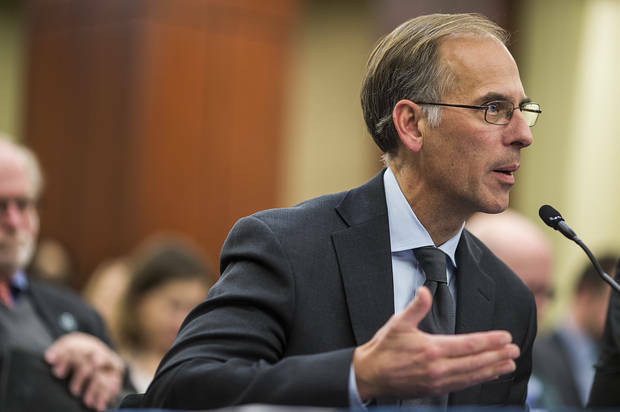 For perspective on current trends and the longer-term outlook, Barron’s recently turned to Mark Zandi, chief economist at Moody’s Analytics and a long-time student of the housing market. Barron’s: Mark, you recently made a strong case for continued strength in the U.S. housing market. Can you summarize it? Mark Zandi: Sure. The current supply of housing is still well below underlying demand. That supply includes single and multi-unit housing and manufactured housing, such as mobile homes. Give or take, that’s around 1.3 million units per annum, up considerably from the bottom during the housing bust of a decade ago. But that’s still very low, relative to demand, which includes the sum of household formations. If a household forms, it has to live somewhere. My calculation also includes obsolescent housing, which involves everything from housing destroyed by hurricanes and wild fires to normal teardowns. Then there are second homes, many of them vacation homes. There are many baby boomers with lots of cash thinking about retirement, and they are putting up second homes. Total underlying demand is running at 1.6 million units per annum, at least. That’s a gap of 300,000 units annually, relative to supply, and it is on top of a market that, broadly speaking, is undersupplied. The vacancy rates across the housing stock are about as low as they get. There are some soft spots in the high-end apartment market, but the broad housing market is undersupplied. How does the consumer’s health look to you? The consumer’s health is about as good as it gets. Unemployment is low and falling, there are lots of jobs, and wage growth is picking up. Interest rates are still low, household debt service is near record lows, and confidence is near record highs. The recent correction in the stock market notwithstanding, wealth has increased greatly. There are lots of tailwinds behind the American consumer and the American household. Mortgage rates have moved up in the past year. The rate for a 30-year fixed mortgage is now around 4.4%, compared with 4% in late December. When will this start hurting demand? In the grand scheme of things, mortgage rates are still very low. In a normal, well-functioning economy, we should have fixed mortgage rates closer to 6%; that’s where you would expect them to be in the long run. It will take a while to get there. The average outstanding mortgage is firmly around 4%. As long as rates move up to 4.50%, 4.75%, or even 5% because the job market is good and wage growth is improving, it’s no big deal. The market should be able to digest that. The problem is when rates move too far, too fast. 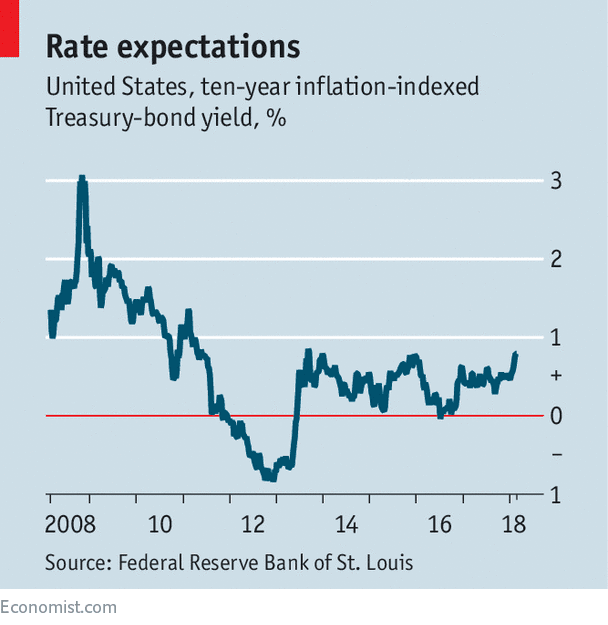 Rates rose about 100 basis points, or one percentage point, in late 2013, after Federal Reserve Chairman Ben Bernanke started talking about tapering quantitative easing [the Fed’s asset-buying program, aimed at boosting economic growth]. That did a lot of damage. Home prices have been rising steadily for the past six years. Is affordability a concern? Not yet. In the middle part of the housing market, valuation is still reasonable and affordability is good. It is no longer a screaming buy, but it isn’t a sell. Valuation is more of an issue at the high end of the housing market. High-end home prices have risen strongly over the past several years, and are now high relative to household income and effective rents, particularly in global gateway cities where there is a lot of investor money sloshing around. What other housing factors aren’t getting enough attention? Immigration matters a lot. It might not matter in a given quarter or even a given year, but over a period of several years, and over a decade or a generation, it’s vital. The key to driving housing demand is households, and the key to household growth is immigration. Natural growth in the population is slowing, because of the aging population. Without immigrants, we aren’t going to see new households, and that means fewer homes will get built, and fewer mortgages will get originated. Fewer homes will get sold, which means a less vibrant market. At the end of the day, the housing market depends on households. If you don’t have households, you don’t have housing. That’s key. The recent tax-reform package doesn’t let homeowners deduct interest on more than $750,000 in mortgage debt. It also caps at $10,000 the amount that can be deducted for state and local taxes. What impact will these changes have on housing? They should weigh on house-price growth. There are areas of the country where the taxpayers rely on those deductions–the Northeast corridor around New York, in particular; parts of Florida; around Chicago; and the West Coast, particularly coastal California. Those markets depend on taxpayers who use those tax benefits, which have been capitalized into house prices. If you get rid of the tax deductions or make them worth less, it stands to reason that it is going to come out of prices. How it comes out of prices is going to take time, but it will come out in those markets, including some places around New York City. However, I doubt prices will decline. Prices in those markets might go sideways for a year or two. Wells Fargo’s woes deepened on Thursday as the bank acknowledged it had overcharged customers at its wealth business, while the scandals that have already hit its other divisions triggered new boardroom departures and fresh criticism on Capitol Hill. The third-biggest US bank by assets has been hit by damaging revelations over the past 18 months about its treatment of customers in a wide range of areas from bank accounts to car loans. Now Wells has divulged more regulatory problems, this time at its investment and wealth management business, which had so far appeared to avoid the kind of troubles elsewhere at the group. Federal authorities are examining possible “inappropriate referrals or recommendations” at the division, which has about 35,000 employees and $1.9tn in assets under management. The bank also said “there have been instances of incorrect fees being applied” and it was conducting an internal review. The latest disclosures came as Jay Powell, the new Fed chairman, told lawmakers in Washington on Thursday that the central bank would “not lightly lift” regulatory sanctions against it, including a cap on its expansion. Under questioning from Senator Elizabeth Warren, a persistent critic of the bank, Mr Powell made clear that he was committed to following through on planned restrictions the Fed laid down last month. On Janet Yellen’s final working day as chair, the central bank said it would bar Wells from increasing its total asset size — the first time the regulator has taken such a step — until the bank had improved its governance and controls. Regulators have also pushed Wells to make further changes to its board, and on Thursday the bank also disclosed the identities of the directors who are leaving. John Chen, Lloyd Dean and Enrique Hernandez, directors since the mid 2000s, will retire along with Federico Peña, a former US energy and transport secretary who has held his seat since 2011. All four will go at the annual meeting in the spring, a faster timeframe than originally planned. A significant minority of Wells shareholders — almost half in the case of Messrs Hernandez and Peña — had voted against their re-elections at the meeting last year. In its annual filing with the Securities and Exchange Commission, the bank said its review into the wealth management business was in its “preliminary” stages. Areas of focus included pension schemes and alternative investments. Wells would not say how many customers had been affected, explain what kind of fees had been incorrectly applied nor clarify language used in the filing, which cited “incorrect set-up and maintenance”. In a statement, the bank said that the disclosures about its wealth business “reflect our continued commitment to transparency, even when all of the information or the final outcome of a matter may not be known yet”. The bank added that it had been “focused on many of the same issues cited by the Federal Reserve”. Betsy Duke, chairwoman, thanked the outgoing directors “for their many contributions and service”. “We respect their decisions to retire,” she added.